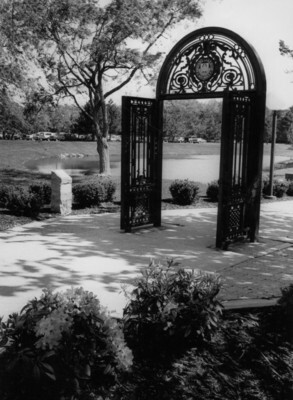 "Class of 1987 Gift -- Walkway/Courtyard Around the Archway"
When the Archway was moved from Bryant's East Side campus(Providence, RI) to Smithfield, RI in 1971, a new tradition developed. Students started walking around the Archway and did not walk though the Archway until graduation day. A dirt path naturally developed around the Archway and thus this gift of a more formal path around the Archway from the Class of 1987. All funds contributed above and beyond what was required to enhance the walkway around the Archway was put towards the creation of a Nautilus Center.